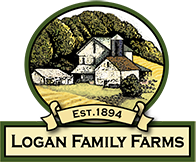 Contact Us – Logan Family Farms, LLC. Our farm is located in Irwin Pennsylvania at 101 Eisaman Road approx. 2.5 mile from the intersection of the PA turnpike (Route 76) and PA Route 30. For automated directions from Google Maps, click the B on the map below, click Get Directions, and enter your starting location. For standard directions, please scroll below. Route 30 E, LEFT on Arona Rd (at the BP station, approx. ¼ mile before turnpike interchange). Proceed on Arona Rd 2.1 miles. RIGHT on Eisaman Rd approx. 0.1 mile to farm at 101 Eisaman Rd. Exit 68 (Irwin), EAST on Route 30. At first traffic light RIGHT on Arona Rd (at the BP station, approx. ¼ mile after turnpike interchange). Proceed on Arona Rd 2.1 miles. RIGHT on Eisaman Rd approx. 0.1 mile to farm at 101 Eisaman Rd.